The initial particle packing of a mix has a strong influence on but is not the only determinant of microstructure and the final relationship between it and the porosity and permeability of a concrete. All of these factors strongly affect the properties of a concrete and must be understood in relation to TecEco cements for proper formulation. Particle packing is taught as part of basic materials processing courses at engineering schools and is very important yet obviously poorly understood by many as for example 1:2:9 and 1:1:6 PC lime mortars in many countries including Australia and the UK use sands designed for hydraulic cements. In relation to our own cements we have seen a number of reports and papers, first from the BRE, then the University of Technology in Sydney and more recently from Cambridge university in which particle packing is not addressed or understood. The fact that an Eco-Cement concrete has to be permeable to actually allow CO2 to permeate through it by gas diffusion and carbonate the binder does not get even a passing mention. All these researchers have made dense concretes with sands designed for ideal particle packing (as required for hydraulic cements) or with a high proportion of fly ash (usually added to reduce porosity and increase density) and expected them to carbonate or alternatively mistakenly thought that brucite was in some way going to contribute to strength which it hardly does. None of the mixes gained good strength as should have been expected because brucite itself is not a good binder and regardless of the CO2 concentration, carbonation cannot be achieved unless the matrices are permeable enough for the efficient entry and diffusion of CO2 molecules to the carbonation reaction front which is thought to be a through solution process . Porosity has a strong correlation with and can be understood to affect strength as well as permeability and thus carbonation and/or durability in dense concretes (including Tec-Cement concrete). The voids as a result of packing affect water demand and visa versa and thus both affect strength. In relation to durability Ollivier and Massat 1992 and many other authors point out the fundamentals which are that permeability (pores and cracks) and reactivity are the main determinants. This is why Tec-Cement concretes are less permeable and why we substitute Brucite for Portlandite in them, removing all the Portlandite with the pozzolanic reaction. Most of the researchers have made dense concretes with way too much Brucite which serves no purpose other than to weaken the microstructure. We do not introduce Brucite as a binder and this must be understood. For Eco-Cement concretes the opposite to Tec-Cement applies. It is important for proper carbonation that carbon dioxide can readily diffuse through a permeable structure. Eco-Cements like good potting mixes must be able to "breathe." For strength it is important to have a strong "skeletal" structure. Overall the matrix must be sufficiently permeable to allow significant CO2 diffusion and this can best be achieved by make sure the particles do not fit together perfectly. One way of achieving this is to gap grade, particularly towards the smaller particle sizes and making sure that the dominant large particles are monograded and able to form a strong skeletal network. The Romans and others have put it more simply and referred to an absence of fines when specifying lime mortars. (See historical record below and paper 26 on our downloads/conference papers page). To understand porosity permeability and CO2 diffusion it is essential to at least have an intuitive grasp of the basics of particle packing. Given that particles are seldom round spheres the complexity is in the detail. Tec-Cement concretes require dense packing and the opposite is the case for Eco-Cement or for that matter any lime mortar or pervious concrete. To make it easier for users TecEco are working on software that will incorporate the science of particle packing, calculate porosity and from that make inferences about permeability and the diffusion of CO2 and hence carbonation rate. The packing of particles has a very strong influence on porosity and thus permeability. As gases such as air or CO2 diffuse more rapidly through open spaces, the rate of gas diffusion is not the same as but depends on permeability. The size of spheres does not matter A roomful of basketballs or ping-pong balls still gives the same proportion of voids. Any deviation from perfect spheres of uniform size results in particles intruding into space taken up by voids thus reducing their volume and most concretes including Tec-Cement concrete require dense packing in order to minimise void space. If the voids left by successively smaller particles are filled the density of packing can be substantially increased. Density can also be increased by using non round particles. Experimental work backed up by the mathematical theory of de Larrard indicates that the mean particle size of the magnesium oxide we use at around 5-8 micron is not far off the right size for ideal packing in Tec-Cement concretes with Portland cement which in Australia has a mean particle size of around 12-15 um. Currently with Tec Cements durability, rheology, shrinkage and increases in elasticity are the main benefits of use. With better particle packing we hope to actually reduce rather than increase water demand and hence improve strength as well. Assuming spheres Larrard calculates the ideal ratio of each size range to be 1:2.41 (4.97 um assumming 12 um for PC ) for perfect packing. Porous matrices may or may not be permeable and for carbon dioxide to enter the matrix of a concrete to react there must be some form of transport. Gas transport is much more rapid than diffusion or solution transport. Porosity is a measure of the void spaces in a material, and is a fraction of the volume of voids over the total volume, between 0–1, or as a percentage between 0–100% . Permeability implies that the the pores are sufficiently interconnected for gases or liquids to be able to pass though. The porosity at which this can occur is referred to as the percolation point. The following diagram should assist coming to this understanding. In the above diagram situation 1 - 4 are matrixes. The red and white dots represent pores or solid material. In the case of white solid material and red pores, 1 is red pore permeable. 4 is red pore impermeable and in the case of red solid material and white pores, visa versa. The percolation point for both red and white pores in the above illustration is somewhere between situations 2 and 3. At some point of relative occurence the red or white dots representing both pores and solid material "percolate" and become connected from one side of the containing squares to the other. Think of the above simple analogy in relation to a concrete matrix. It is clear that porosity does not mean permeability. If the percolation point is not exceeded at a given porosity the concrete is not permeable. Porosity leads to permeability but does not imply permeability. The industry use the term pervious but mainly in relation to the ability to let water pass through. An understanding of percolation theory is required and a Geoffrey Grimmett from Cambridge University has written a book on the subject . Remember that CO2 molecules are very very small indeed and so the space through which they need to pass does not have to be very large. It is thus possible to pack particles in such a manner as to achieve gas permeability right down to very small sizes however an understanding of the maths is required. To make a good Eco-Cement that sets by carbonation in the atmosphere it is essential that the matrix is sufficiently porous for the porosity to exceed the percolation threshold so that the matrix is permeable for air carrying a small percentage of CO2 to readily diffuse through to the reaction area. Although the Gibbs free energy for the carbonation of Brucite to nesquehonite at - 38.73 kJ·mol-1 is less negative that for the carbonation of Portlandite to calcite at = - 64.62 kJ·mol-1 the limiting factor is usually the kinetics of gas and water permeation to the reaction front and this is a function of the permeability of the matrix. As CO2 is only approximately .038% of the atmosphere by volume, a considerable amount of air must pass by or through a reaction front for sufficient CO2 to be provided to the carbonation reaction in a developing carbonate binder matrix. Consider the carbonation of 40.31 grams of MgO forming nesquehonite as in a carbonating Eco-Cement. 44.01 grams of carbon dioxide and 64 grams of water are required. Given the volume and mass of the components of air approximately 98 kilograms of air must pass by the reaction front just to provide the CO2 required. The water needed will come both from water in the mix and from the air, the amount required depending on the humidity, rainfall etc. and our experience is that wet dry seems to work best. i.e. outside conditions. Assuming CO2 delivery to be the governing kinetic constraint, doubling, quadrupling or even increasing the CO2 concentration by ten or twenty fold as is proposed by many researchers will only proportionally increase the amount of CO2 delivered to a reaction front and thus the rate of carbonation. According to ECN  "The CO2 concentration in power station flue gas ranges from about 4% (by volume)for natural gas fired combined cycle plants to about 14% for pulverised coal fired boilers." At 10% the rate increase over atmospheric could be expected to be 10/.038 = 263 times provided other kinetic barriers such as the delivery of water do not set in. In each case doubling the basic dimensions will increase the cross sectional area by four (4) times thereby increasing the rate of gas diffusion by the same factor and allowing approximately 4 times as many molecules to pass through or by a reaction front at the same pressure. The relationship whereby if the cross sectional dimensions of a pore are doubled then the cross sectional area quadruples is true for all two dimensional shapes. At nano scales of course the local atomic surfces with provide interference but for our discussion we have assumed this to be minimal. The case of a cement matrix is much more complex because permeability depends on other factors as well such as the number of interconnected pores, their length, size and tortuoisty and gas diffusivity still others including the molecular size and physical state of the diffusant. As might be expected there are a number of models. Garboczi 1990  who is a well known researcher at NIST and Ollivier and Massat 1992 who provides reviews of some of the models and both concur that Katz-Thomson theory, which is based on percolation theory and originally developed for the oil industry gives good correlation for permeability and according to Garboczi 1990  also for diffusivity. All describe porosity and the inherent difficulties in its measurement and determination of its relationship to permeability. In the Katz-Thompson approach, permeability is a squared function of the critical pore diameter defined as the dimension of the first continuous pathway created by a non wetting fluid invading a porous specimen initially saturated by a wetting fluid. The critical pore diameter is measured by mercury intrusion and as might be expected the expression used in Katz-Thompson permeability theory squares it and thus has the same multiplier effect as in the above simple cases. i.e. a quadrupling in area for a doubling of dimensions. The basics presented here should be realised by anybody trying to achieve efficient carbonation and be enough to convince them that grading the particles in a matrix to make it permeable is essential if carbonation is to ensue. Doubling the average pore size will quadruple the rate of gas transport and thus carbonation. For the purposes of TecSoft's software project Katz-Thompson theory based on experiement is not of great use because our objective is to predict concrete properties from the fundamentals to reduce expensive errors and the need for experimentation such as mercury intrusion. To reduce the need for measurement other than for confirming the accuracy of predictions we have taken the approach of de Larrard to calculate porosity and then applied the work of the researchers at NIST (including Garboczi and Bentz) who have developed computer simulations using percolation theory to determine permeability. Given this approach porosity and thus permeability can be calculated from the packing density. Intuitively the more voids the more they are interconnected and from this we can develop thresholds that agree with real data. Consider two cases of a binary mix. If the larger particles are dominant the voids are much more than if smaller particles are dominant. From the above very simple illustrations taken from de Larrard's book  it is evident that a skeletal structure of larger particles and a lack of fines will result in permeability as experts know from practical experience from the days of the Romans. (See historical record below and paper 26  on our downloads/conference papers page). In the more complex case of a multitude of sizes in a closely packed matrix this strategy translates to gap grading particularly in the mid to fines range and to some extend at least mono sizing the dominant particle..
We can calculate the porosity of a concrete from the particle sizes and packing, the question arises as to what are the thresholds between porosity that is impermeable and porosity that becomes interconnected and thus permeable? To determine this we will be using percolation theory with the help of Garboczi, E. J. and D. P. Bentz (1999)  who have developed it for dense concretes and according to whom "The main concept of (which) is the idea of connectivity. Picture some sort of structure being built up inside a box by the random attachment of small pieces to each other. Percolation theory attempts to answer the question: At what point does the structure span the box. The percolation threshold is defined by the value of some parameter, say volume fraction of the structure in the box, right at the point where the structure either achieves or loses continuity across the box." A model that consists of overlapping "soft" spheres placed randomly in a box simulates the growth of solids like concrete. If the volume fraction covered by the collection of spheres is monitored until they form a continuous structure it is found that they will occupy 29% of the volume with changes in shape changing this threshold. A convenient way of conceptualising this threshold is as the quantity fraction connected "defined as the volume fraction of capillary pores that make up a connected path through the sample divided by the total volume fraction of capillary pores." This threshold for dense PC concretes has been worked out by Garboczi, E. J. and D. P. Bentz (1999)  and found to be about 20% +- 5% depending on particle size distributions, morphology of particles and degree of dispersion (and thus packing). A further complication in the model is the presence of an interfacial transition zone which is itself usually more porous. In dense concretes as hydration proceeds the capillary pores become blocked off and diffusion takes over through both the remaining but disconnected pores and the CSH gel pores (micro pores). The NIST team have done some modeling of diffusion through these pores and at a later date TecSoft, our subsidiary will include this and other modeling in our TecBatch software. Diffusion modeling is not a urgent as getting across the basics for rapid carbonation for which the limiting factor is permeability not the rate of diffusion. The issue of the permeability of Eco-Cements for efficient carbonation is similar to that of dense concretes but the capillary pores must be formed as a result of the packing and not as a function of the water - binder ratio and we expect the thresholds will when calculated and confirmed by experiment turn out similar to those found by Garboczi, E. J. and D. P. Bentz (1999) . According to unpublished work from Bentz the figures are 25% for needle like products and 30% for plate like products. See also Garboczi, E. J. and D. P. Bentz (1996) . The historical record is entirely consistent with everything we say about successfully formulating a carbonating cement like Eco-Cement. According to Benjamin Herring, editor in chief of constructor magazine “The Romans had two distinct types of concrete mortar. One was made with simple lime and river sand, mixed at a ratio of three parts sand to one part lime. The other type used pozzolan instead of river sand and was mixed at a ratio of two parts pozzolan to one part lime.” (Herring 2002)  . The Romans had two distinct types of concrete mortar and they understood the particle packing requirements of both. One was made with simple lime and river sand, mixed at a ratio of three parts sand to one part lime. The other type used pozzolan instead of river sand and was mixed at a ratio of two parts pozzolan to one part lime. The former required coarse gritty aggregates described below whilst the latter was even tamped into position to increase density. The oldest we have come across addressing the issue of sands for carbonating and hydraulic cements used by the Romans is book II, chapter IV of the Ten Books of Architecture by Vitruvius Pollio (Pollio 27 - 23 BC). According to Vitruvius “the best (sand) will be found to be that which crackles when rubbed in the hand, while that which has much dirt in it will not be sharp enough. Again: throw some sand upon a white garment and then shake it out; if the garment is not soiled and no dirt adheres to it, the sand is suitable” Vitruvious was talking about gritty sand with no fines. There is no doubt that grading is one of the most important parameters for properly carbonating mortars. As a further example of older literature supporting the view that coarse sands and a lack of fines are required for carbonating mortars are the comments by the 16th century architect Andrea Palladio, renowned for "The Four Books of Architecture" which were translated into English in the early 18th century and used as a principal reference for building for almost two centuries (Palladio 1738) . In the first book Palladio says, inter alia, "the best river sand is that which is found in rapid streams, and under water-falls, because it is most purged". In other words, it is coarse. Compare this with most sand for use in mortar today (Jordan 2004) . Alf Waldum of the Norwegian Building Research Institute states at page 4. “in the "good quality" ancient mortars relatively coarse sand is often found. Grains up to 6 - 8 mm were often used for renders 20 - 30 mm in thickness and for masonry mortars." (Waldum). Few people today know how to make a carbonating mortar as has been evident from the rash of papers about our Eco-Cements that are completely wrong in relation to the requirements for carbonation. Unfortunately this is also true in relation to cements containing lime. Too often the focus is on ease of use rather than end result, For example in the most used 1:1:6 or 1:2:9 (pc, lime, aggregate) type mortar mixes, the aggregates used are generally much too fine and well graded for the lime to serve as much other than a plasticiser. Given the increasing popularity of these mortars and the possibility of carbon credits for sequestration it is essential that researchers and the industry get their respective acts together. Using standard concrete spec sands as did the BRE or a lot of similarly graded fine materials (such as MgO, PC and fly ash) as was the case with the University of Technology, Sydney and Cambridge University in Eco-Cement Concretes will not result in sufficient permeability for efficient carbonation. Eco-Cements must be permeable to allow air to pass through and are are thus best made with a lack of fines. They are gap graded in the smaller sizes and somewhat mono graded in the dominant size range so there is a maximum amount of free space available for air flow. The relatively pervious nature of Permecocrete is what allows water to pass through so it can act as a permeable or pervious pavement. If water can pass through so can air allowing the Eco-Cements that is holding the stone together.to set by carbonation relatively rapidly. Once past the threshold permeability (the percolation threshold) the carbonation rate will increase dramatically. Below this threshold carbonation is by diffusion and insignificant. The Rate of Carbonation is Proportional to Permeability and Declines with Time. 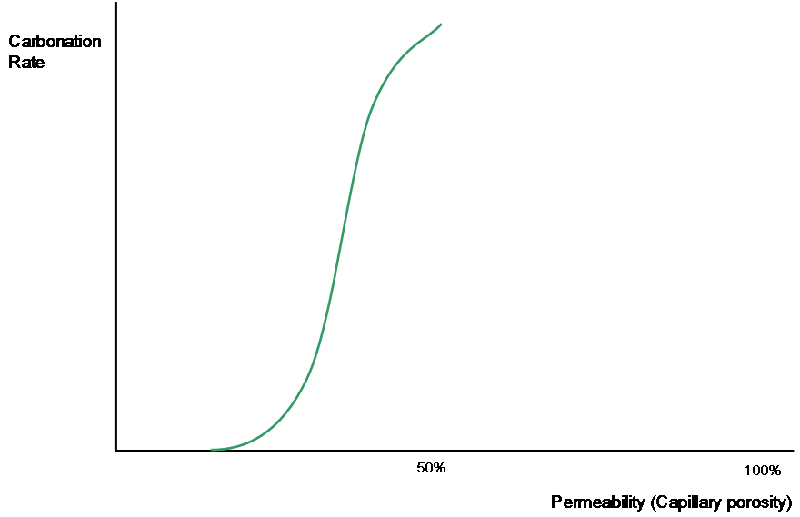 Given permeability is achieved the rate of carbonation follows a simple asymptotic curve similar to but slightly delayed in relation to that for the hardening of hydraulic PC concrete. For the benefit of our opposition who are claiming that our blocks take 6 months to carbonate, the last commercial lot that were made at the time of editing this page were made, delivered and erected within a week. The main goal of TecEco technology is to improve the sustainability of cementitious binders. There are several ways in which particle packing interacts with this goal. Eco-Cements only absorb CO2 if they are sufficiently permeable. On the other hand the denser Tec-Cements can be made the less binder required. Both objectives require an understanding of particle packing. Optimising the particle packing of Tec-Cement concrete not only results in improved strength but also reduces the porosity, the segregation potential and increases durability and other favourable properties. Another way of increasing the sustainability of concrete is to use waste as aggregates and the aim of TecEco is to incorporate as much waste as possible in concretes used in the built environment. Unfortunately few wastes are suitable for use either because of their chemical nature or because of their size distribution. The problem of internal reaction is solved by the chemistry of the new TecEco calcium-magnesium blends whilst more optimal particle packing will by modification allow wastes to be used as aggregates. By the addition of corrective aggregates the overall size distribution can be improved and thus performance. At TecEco we believe the improvement in sustainability that can be achieved with more optimal particle packing to be significant and this is the case fior Eco-Cements which must be gas permeable and with dense Tec-Cement concretes as less cement need be used. For example in an Eco-Cement there is significant volume increase on the hydration and carbonation of MgO and a strong contribution to microstructure from the shape of the main mineral formed which is nesquehonite. Permeation is the penetration of a permeate (such as a liquid, gas, or vapour) through a solid, and is related to a materials intrinsic permeability. Permeability is tested by permeation measurement and can be calculated from fundamental properties as in the case of TecBatch, the software developed by TecSoft Pty. Ltd., an associated company. Diffusion is a spontaneous process that describes the movement of a fluid (liquid or gas) down a concentration gradient. It is simply the statistical outcome of random motion. Diffusion increases entropy but decreases Gibbs free energy and is therefore is thermodynamically favourable. Diffusion operates within the boundaries of the Second Law of Thermodynamics because it demonstrates nature's tendency to wind down, as evidenced by increasing entropy. Diffusing molecules will move randomly between areas of high and low concentration but because there are more molecules in the high concentration region, more molecules will leave the high concentration region than the low concentration one. Therefore, there will be a net movement of molecules from high to low concentration. 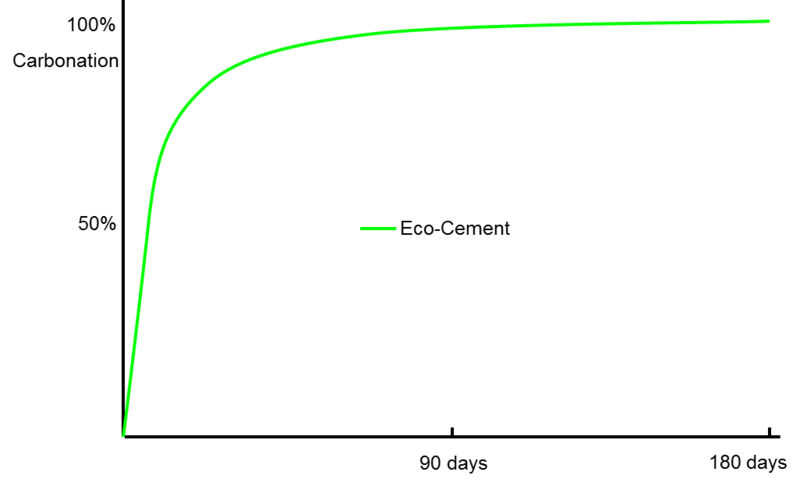 The diffusivity of a diffusant defines the rate of diffusion down a known concentration gradient. Brucite is not a good binding mineral unless strongly compressed ( Ramachandran, V., R. Feldman, et al. (1981). Concrete Science - Treatise on Current Research. London Philadelphia, Heydon & Son Ltd.) and in Tec-Cement concretes is used for rheology, setting characteristics, durability and shrinkage control only. Because it promotes the more complete hydration of PC it is also thought to reduce autogenous shrinkage and improve long term strength. Quillin, K. and P. Nixon (2006). Environmentally Friendly MgO-based cements to support sustainable construction - Final report, British Research Establishment. Ollivier, J. P. and M. Massat (1992). "Permeability and microstructure of concrete: a review of modeling." Cement and Concrete Research 22: 503-514. The example in our patent specification which we suspect has been religiously followed by some researchers is and Enviro-Cement and not a good one in relation to some of the principles involved in making our Tec or Eco-Cements and we apologise for this. We therefore encourage researchers to talk to us directly for proper guidance. At the present time TecEco are working to improve the particle size of the magnesia it supplies to reduce the obvious fineness demand for water. Harrison, John (2005) Carbonating and Hydraulic Mortars - the difference is not only in the binder. Aggregates are also important. Proceedings Concrete 05, Concrete Institute of Australia, 17-19 October, 2005, Melbourne. de Larrard, F. (1999). Concrete Mixture Proportioning: A Scientific Approach, E & FN Spon. Grimmett, G. (1999). Percolation. Heidleberg, Springer. Garboczi, E. J. (1990). "Permeability, Diffusivity, and Micro structural Parameters: A critical review." Cement and Concrete Research 20: 591-601. Ollivier, J. P. and M. Massat (1992). "Permeability and microstructure of concrete: a review of modelling." Cement and Concrete Research 22: 503-514. Garboczi, E. J. and D. P. Bentz (1999). "Computer Simulation and Percolation Theory Applied to Concrete." Annual Review of Computational Physics VII: 85-123. Garboczi, E. J. and D. P. Bentz (1996). "Modeling of the Microstructure and Transport properties of concrete." Construction and Building Materials 10(5): 293-300. Herring, B. (2002). The Secrets of Roman Concrete. Constructor. Virginia, Associated General Contractors of America (AGC). Vitruvius, P. (27-23 BC). The Ten Books of Architecture. Rome. Palladio, Andrea (1738). The Four Books of Architecture. Jordan, J. W. (2004). The Conservation and Strengthening of Masonry Structures. Proceedings of the 7th Australasian Masonry Conference, Newcastle, New South Wales, Australia, University of Newcastle, Australia. Waldum, A. M. Historic Materials and Their Diagnostic, State of the Art for Masonry Monuments in Norway, Norwegian Building Research Institute.